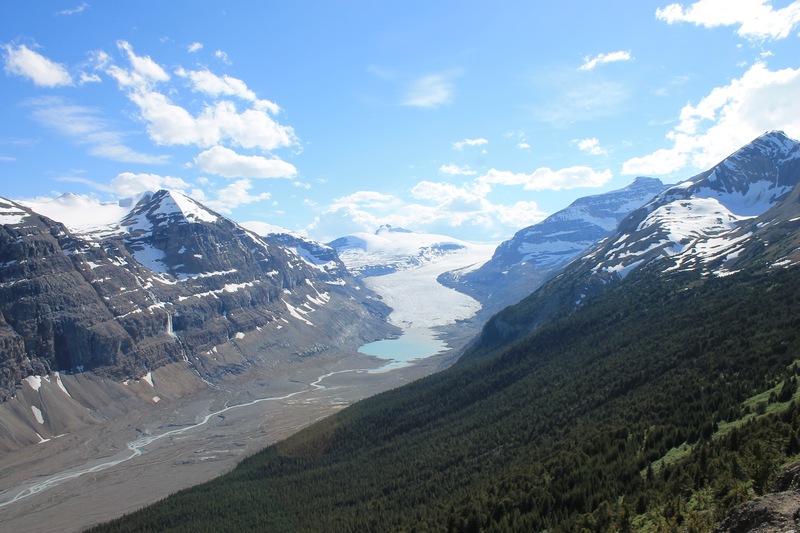 The North Saskatchewan River originates from the Saskatchewan Glacier in the Columbia Icefields 1800m above sea level. 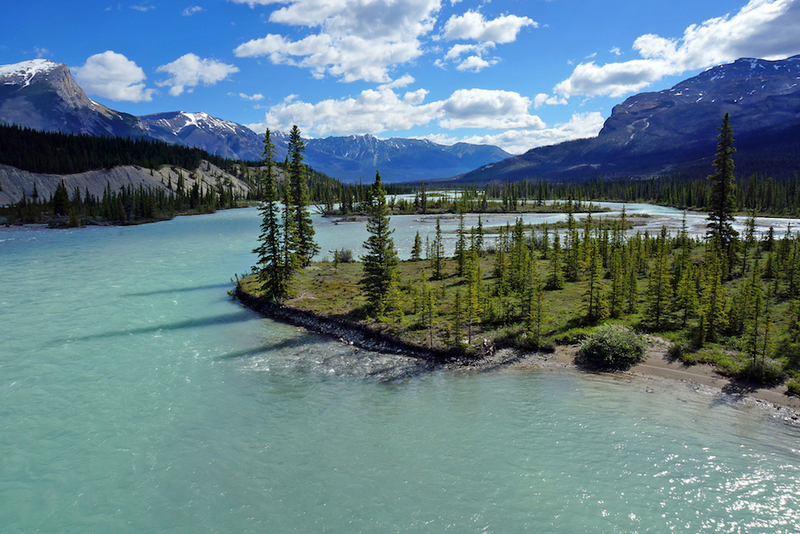 It flows through the Rocky Mountains into the manmade Abraham Lake which is created by bighorn dam. It continues out of the Rockies, travels east to Rocky Mountain House and then north past Drayton Valley. During this stretch the landscape is mostly forested and natural. It then meanders through mostly farm and prairie land before reaching the city of Edmonton. The river twists and turns northeast and cuts right through the city. It then travels east through the rest of Alberta and into Saskatchewan. 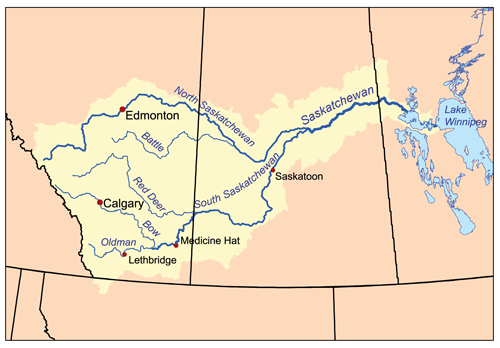 About 50km east of Prince Albert, it unites with its partner the South Saskatchewan River forming the Saskatchewan River. Eventually the water flows into Lake Winnipeg and furthermore to Hudson Bay via the Nelson River. At the start of its journey the river is narrow and fast-moving. Its headwaters are glacier fed which means the water is freezing cold, crystal clear, and super clean. The river bed is mostly rocky making the water turquoise blue throughout its leg out of the Rockies. As the river makes its way to Edmonton, it slows down and becomes wider. The river bed here is mostly rock, gravel, sand, and silt. During spring melt and periods of heavy precipitation the water can appear murky due to naturally occurring sediments. This is caused by resuspension and erosion of the river bed and is important to the natural function of the river. As summer progresses the river flow slows down and the water clears up. This makes for the best time to enjoy recreational water use. There is a variety of wildlife that depend on the North Saskatchewan River in and around the Edmonton area. Mammals such as Beavers, Muskrats, Porcupines, Deer, and Coyotes are frequently seen and live in the river valley. The river itself is home to an abundance of fish species including Walleye, Burbot, Northern Pike, Mountain Whitefish, Sauger, and Lake Sturgeon. We get all our water needs from the river, and ultimately water gives us life. From our drinking water, to bathing, to the toilet it all comes from the river. It is vital that we keep the river clean and natural to make sure it can sustain us in the future.